Currants (Ribes spp.) are a large group of woody shrubs, some of which are grown for their ornamental qualities and others that are cultivated for their edible fruit. The berries of the edible varieties are commonly found on grocery store shelves in Europe, though it remains a relatively obscure fruit in the United States. Currants are closely related to gooseberries, which share the genus Ribes, but are thornless and bear fruit that are not as large or as sweet. On the whole, currants can be classified as deciduous, cold-climate shrubs, though there are a few exceptions among the dozens of species. The most popular of the ornamental currants, called flowering currants (Ribes sanguineum), are upright shrubs typically growing to 10 or 12 feet in height. These bear a profusion of colorful flower clusters in late winter, just as the leaves are emerging from the bare branches, and later become covered with berries that are favorites of birds. Pink-, red- and white-flowering varieties are available. Alpine currants grow four to six feet in height and are primarily used as a hedge species in areas with extremely cold winters. Golden currants grow six to eight feet in height and bear yellow flowers that smell of cloves and vanilla. Evergreen currants grow about two feet tall and spread widely; they are the only species that thrives in hot climates where winters are mild. The berries of all species in the Ribes genus are technically edible (they are not poisonous), but some are grown particularly for their edible fruit. All of the following varieties grow three to five feet tall and wide. Black currants have dark-colored berries that are considered an acquired taste by many when raw, though they are quite popular for pies and preserves. Red currants have a more palatable flavor than their dark-colored relatives when raw and are often used fresh in salads, yogurt or eaten out of hand. White currants are an albino variety of red currant that is noted for its sweeter flavor and unique translucent berries. 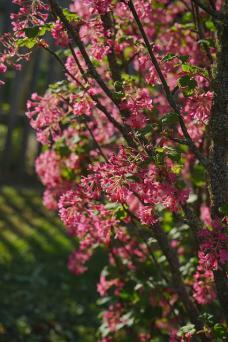 Flowering currants are a top-notch shrub for use as a focal point amid a bed of smaller perennials. They have a graceful vase-like form and maintain an attractive appearance in all four seasons. 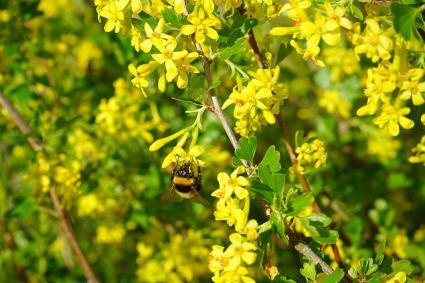 The other ornamental varieties are not as showy, but are often used in wildlife plantings, native gardens or in situations where tough shrubbery is needed. The edible currants are typically planted at the edge of a vegetable garden in rows with other berry shrubs, such as blueberries, blackberries and raspberries. The long thin branches are easily trained flat against a wall, which is a popular technique for fitting the shrubs into small spaces. 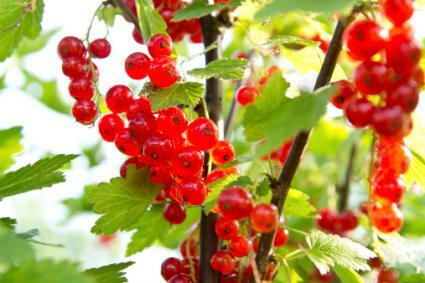 In nature, currants are forest edge species, meaning they do well in part sun and rich soil. Amending the soil with compost prior to planting is especially important for the edible varieties, though the ornamental currants are more forgiving of soil conditions, as long as it is well-drained. Evergreen and alpine currants are moderately tolerant of dry soils, but the other varieties need regular moisture - plan to provide water on a weekly basis other than when there has been a soaking rain. Alpine currants and golden currants have a dense growth habit that makes them suitable for trimming as a formal hedge. Flowering currants can be pruned in fall or winter to remove excessively dense growth from the center of the shrubs and to maintain a symmetrical vase-shaped form. Evergreen currants grow as a tall groundcover and are not typically pruned. Remove branches that grow toward the center of the bush in order to maintain an open center. Remove the oldest 25 percent of the branches each year (the thickest branches). Cut back the remaining branches by about 25 percent each year. Currants rarely have serious problems with insect pests, but they are quite susceptible to disease. In particular, powdery mildew and other fungal pathogens are commonly seen on currants, especially the edible types. These proliferate in humid conditions, so ensuring that the plants have good drainage and adequate airflow is essential. Severely diseased wood should be pruned off and destroyed, though routine applications of fungicide are sometimes necessary to grow currants successfully. The other major disease of currants does not adversely affect their growth, but has devastating effects on white pine trees - it's called pine blister rust. Currants are a vector for this pathogen which has been responsible for the death of millions of pine trees across North America. For this reason, it is important to never plant currants within 1000 feet of a white pine tree. Whether your goal is to harvest fruit or just enjoy a beautiful backyard planting, currants are a group of plants with much to offer. There are many varieties out there, so it's best to check with a local nursery for information on those that perform best in your area.